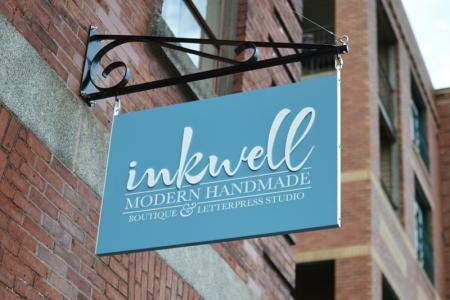 Founded in 2011, Inkwell Originals is the in-house studio of Inkwell Modern Handmade Boutique & Letterpress Studio located in downtown Halifax and a collaboration by graphic designers Andrea Rahal and Daniel MacDonald. The studio operates antique letterpresses to create tactile products from art prints to custom stationery. Inkwell offers custom letterpress printing of personal stationery, business cards, event invitations, posters and art prints. We approach letterpress printing as an art form. We enjoy the hands-on approach to printing and work with clients to create unique, hand printed pieces.